For many years the .380 ACP wasn’t a hugely popular cartridge for concealed carry or home defense, but times they are a-changing. Looking to buy your first .380? Have one and need to know what to feed it? Let’s take a look at some of my favorite ammunition choices and break down the important facts of ammo selection. 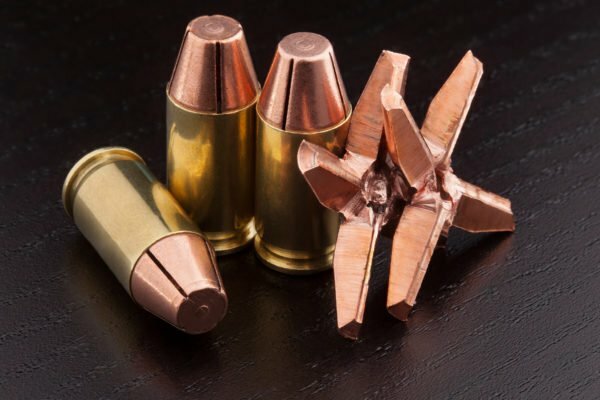 The problem with this is that with so many types of .380 ACP ammo on the market, how do you know which one is the best defensive ammunition for you? Well, I could just say buy this round made by so and so and you’ll get the performance you need. However, there are numerous factors to consider when choosing self-defense ammo. I will give a few suggestions of brands and loads I know to be top quality, but ultimately you are going to walk away with the know-how necessary to choose the best .380 ammunition for you. 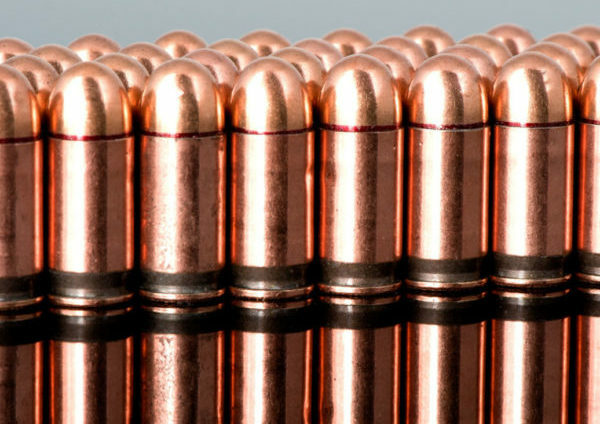 Here are the most important factors to consider when choosing .380 defensive ammunition. Penetration refers to the ability of a projectile to travel through the body, determined by its composition, its weight, the velocity it reaches, and it’s projectile type. A lead projectile will often bend, break and deform before it can penetrate deep enough to cause serious harm. The same goes for a round that is too light and too slow. You want a round that can penetrate 12 to 18 inches of 10% ballistic gel. You’ll need to find a test that utilizes a firearm with a similar length barrel to the weapon you intend to carry. A penetration test will look something like this. Expansion of projectiles is critical for blood loss and even pain compliance. The larger a round can expand the more damage it will do. When researching expansion for a certain load know that bigger is always better, but expansion comes second to penetration. If possible, find how the round expands through ballistic gel after being shot through denim. Denim can cause some rounds to fail at proper expansion. When researching expansion you should know a .380 is a .35 caliber projectile. Most ammunition tests measures expansion in inches. So anything over .35 is measured expansion. Reliability refers to the round’s ability to reliably expand and reliably penetrate. During research, if you see tests with conflicting data or tests where only 3 out of 5 rounds penetrate at least 12 inches or fail to expand reliably that is something to consider. The reliability factor also applies to the round’s reliability to ignite and fire. Most defensive ammo is high quality and you’re unlikely to find an established company producing ammo that doesn’t go boom. But stuff happens. One of the biggest factors that determine how a round will reliably penetrate and expand is the type of projectile. The classic bonded jacketed hollow point ammunition has long been a solid performer in both penetration and expansion. Stay away from FMJ rounds since they do penetrate, but often penetrate way too much. They also will not expand in any way. I also advise staying away from gimmick projectiles that look cool but function poorly. A projectile’s ability to retain weight after expansion and penetration is a good measure of the rounds ability to deal damage to a vital part of the body. The more weight retention the better. Bullets are measured in grains, so when researching ammunition look at what the projectile weighs before and after the test. 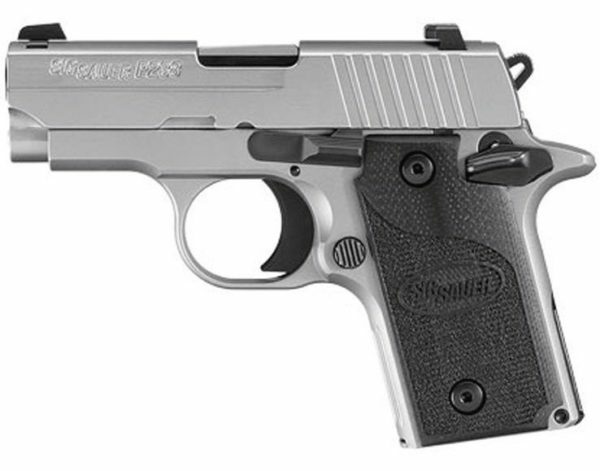 Most .380 ACP handguns are what we call pocket pistols. They are very small with short barrels. 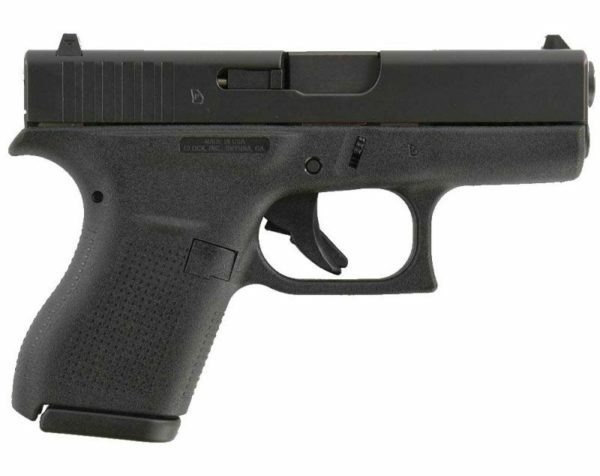 A large pocket pistol like the Glock 42 only has a barrel length of 3.25 inches. Commonly these pocket pistols will have a barrel under 3 inches. This affects the velocity of a projectile, as does the projectile’s weight. When searching for the best .380 Defensive ammo you need to find a good compromise between barrel length, projectile weight, and the round’s velocity. For a pocket pistol, a 90-grain projectile seems to be the heaviest round that penetrates deep enough to strike something critical. The rounds also meet a high enough velocity to expand. The lighter 77 grain and even 50-grain rounds are fast but often fail to penetrate. 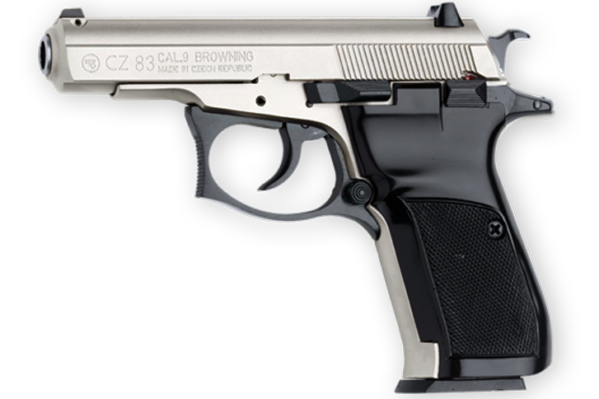 The heavier 102-grain rounds are better suited for handguns with barrels longer than 3.5 inches like the Beretta Cheetah and CZ 83. Defensive ammunition is purpose-built to shoot people, animals, and the occasional overtly aggressive watermelons that are trying to cause you harm. 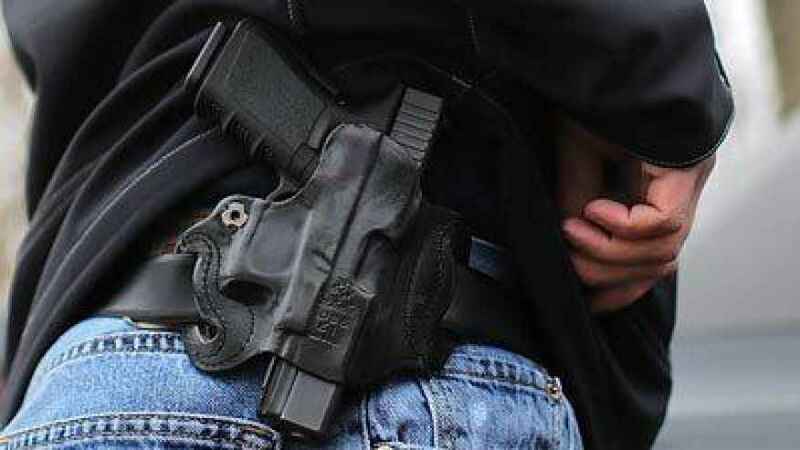 As a civilian concealed carrier or home defender, your goal in any defensive situation is to end the threat. It’s not a matter of shooting to kill, or shooting to wound, you shoot to end the threat. I tell people all the time if you shoot an attacker and all it does is graze them and they run away, you’ve stopped the threat. So if your goal is to stop a threat, your ammunition’s goal is to be capable enough to stop the threat as well. Bullets stop threats in a number of ways. The first and most unreliable is fear. It relies on criminals thinking, “he has a gun and he can shoot me.” It doesn’t matter what kind of bullet it is since the very thought of the bullet is enough to end the threat. This is the wrong soccer mom to threaten. Next, we have pain compliance. Pain is subjective to the person being shot. The difference in pain tolerance has an effect on ending the threat. So does the location of the gunshot wound and the presence of drugs and alcohol in the body. Blood loss can also be an effective means to stop an attacker and can be caused by a bullet depending on where the bullet is placed and the size of the projectile. Now, when I say projectile size I don’t mean the size of the actual bullet before it’s fired. The difference between a .380 ACP and 40 S&W is literally a millimeter in projectile size. The projectile size that matters, in this case, is how big the round expands after it hits the body. Blood loss can often take several seconds to several minutes, so it’s not the quickest means to end a threat. Lastly, the most effective means of stopping an attacker is through trauma to the central nervous system. This will typically result in the death of an attacker, as well as near instant incapacitation. 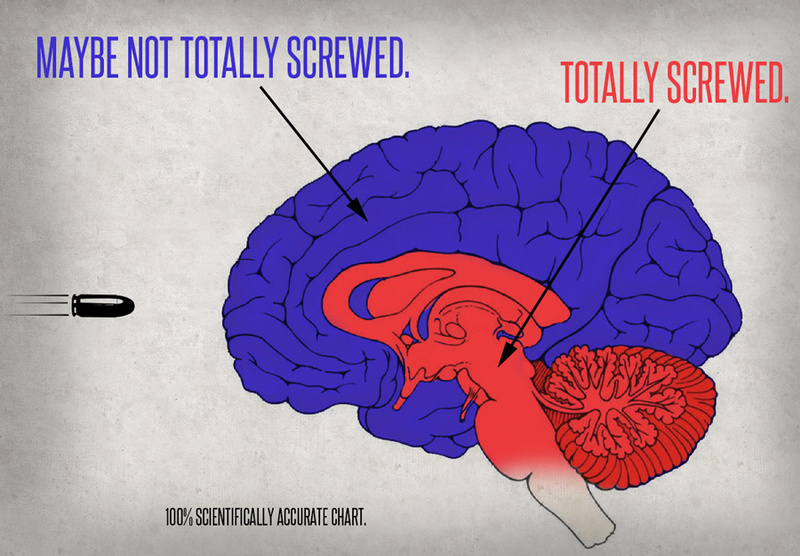 This kind of trauma requires a shot to or near the spine, the brain, and brain stem. Basically how a shot to the head works. Remember that just because this is the most effective means of stopping an attacker does not mean it is always appropriate or legal to use this level of force. Make sure you know your state’s laws regarding self-defense. This is all important when it comes to ammunition selection for any handgun. 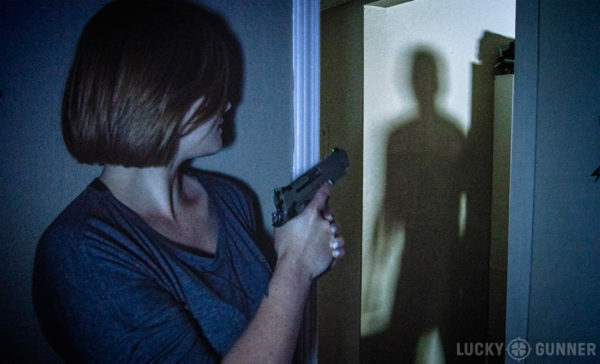 The round you choose must be able to accomplish these tasks to incapacitate an attacker. A .380 ACP is a lower powered round, so ammunition selection is even more critical. Otherwise, what’s the point of carrying this around? There are a lot of myths and legends regarding pistol ammunition. People who believe these myths will often use them to discourage the use of .380 ACP and even 9mm. These myths are quite popular, so to help you sort through the bull mess we’ll go over the biggest two. The stopping power myth is so widespread that it has seeped into gun culture. I cringe when I hear someone bring up stopping power. There’s simply no such thing. The ability of a round to stop an opponent hinges on the shooter’s ability to strike a vital portion of the body, and for the round to penetrate deep enough to hit something vital enough to incapacitate. Shot placement and penetration are the key to stopping an attacker. A miss with a .45 is still a miss, and the heart, lungs, and brain do not know the difference between a .45 and a .380. Hydrostatic shock is a thing, but it’s not something that really occurs with handguns. To achieve hydrostatic shock damage, a projectile has to move at over 2,000 feet per second. Very few handguns can achieve a speed of over 2,000 feet per second and .380 ACP rounds certainly can’t. While I won’t name one round to rule them all, I can make some suggestions based on my personal research into an effective round for my SIG p238. For reference, this weapon sports a 2.7-inch barrel. The Hornady Custom .380 ACP features their XTP projectile that penetrates very well. This projectile is really the key to this ammunition’s success. It penetrates and has controlled expansion to allow the round to gradually expand as it travels through the body. The rounds aren’t too expensive and are pretty common. What’s your take on Hornady’s defensive .380 round? I’m not going to lie: the biggest reason I was attracted to the HTP loads was the price. These High Terminal Performance loads come in boxes of 50 and are priced at less than 50 cents a round. The round is a solid performer that penetrates and even expands to an impressive degree. Testing done by Chris Baker at Lucky Gunner has shown this round to be incredibly effective in both penetration and expansion. The round has no issue reaching that 12-inch mark, and also expands up to half an inch in size. SIG’s ammunition is well built and surprisingly affordable. If you are recoil sensitive, then the Liberty Defense 50 grain rounds are comfortable, but you should know they are poor penetrators. But if you can’t handle the recoil from a traditional round then these bad boys are better than nothing. Prvi Partizan makes a huge range of ammo and much of it is odd calibers or calibers that just aren’t in production anymore. That is how I first started using them with their .303Brit ammo. Since then, I’ve come to know and respect many of their calibers and they have become one of my goto picks for range ammo. I’ve never had a problem with Fiocchi, every round has gone bang like it should. However – it is some of the dirtiest ammo I’ve used. After 200 rounds of their 9mm my slide starts to stick and after 300 I need to clean it if I want to keep things running smoothly. Still one of the main brands I use for range ammo. Two things to be said for Silver Bear: it’s steel cased and it’s cheap. Generally, it is very reliable, at least for me it has been, but it is stunningly inconsistent. Groups with otherwise very accurate firearms will bust open wide when using Silver Bear ammo of any kind. But it is by far my top pick for range ammo when I need to dump rounds, mostly because it is just so much cheaper than almost anything else on the market. There is strength in community, and the gun community is no different. I’ve listed what I think is important to consider when choosing ammunition, but I’d love to hear what you think. Need more ammo reviews or recommendations? From .22lr to 5.56mm We Got You Covered. Do you consider other factors when choosing defensive ammunition? Do you have suggestions for .380 ACP defensive loads from companies? Tell us in the comments below. what about Lehigh defense 65gr. xtreme defense rounds? it creates ballistic’s close to 9mm. First review I’ve seen saying Fiocchi Ammo is dirty. Most reviews mention how clean it is! I’ve used it. Cleaner than most ammo I’ve used in 9mm, 38 Special, 380 Auto, 357 Magnum. Buffalo Bore +P 95 grain hollow point, 1125FPS with 267 ft. lbs.